Teju Cole’s stunning first novel. In "Revelations in the Key of K," poet Mary Karr is in the midst of recalling a childhood experience when, she says, "the instant went, the month, and every season / smeared, till with a wrenching arm tug / I was here, grown." 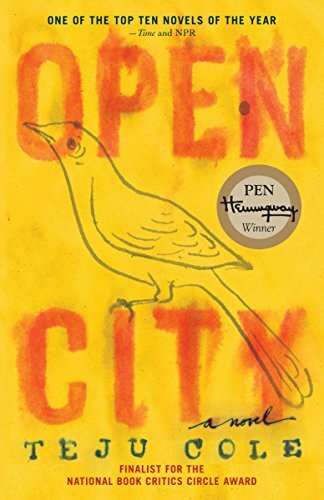 That "wrenching arm tug" that makes us come awake is what we experience over and over in Teju Cole's stunning debut novel, Open City. First we're dropped into the middle of everything, jolted awake in the middle of a sentence: "And so," the narrator begins, "when I began to go on evening walks last fall, I found Morningside Heights an easy place from which to set into the city." He then sets into the city—New York City—and we follow at his heels, dodging traffic and dogs and tourists as we try to keep up. Then the arm tugs, again and again, as Julius' story unspools as a sequence of scenes and memories, Proustian in its propensity for letting small occurrences spark stories and stories-within-stories that layer into a whole man. And yet there are holes in that whole—bits Julius may be forgetting or suppressing, but that rise up and startle us, and Julius too.